MainAll NewsForeign AffairsWill Trump decide to pull out of peace talks? Will Trump decide to pull out of peace talks? The London-based Arabic daily al-Hayat on Saturday reported that US President Donald Trump is debating whether to pull out of Israeli-Arab peace talks. According to the report, despite the US claims that the meeting between senior White House adviser Jared Kushner, US Middle East Envoy Jason Greenblatt, and Palestinian Authority Chairman Mahmoud Abbas was "positive and fruitful," Abbas described it as "tense," with the US demanding he put a stop to incitement against Israel. 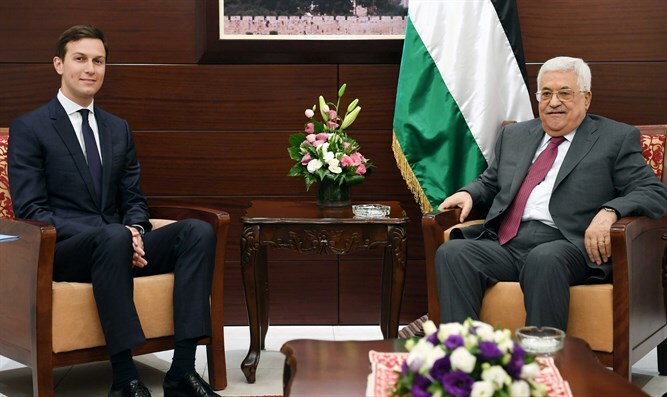 During the meeting, Abbas claimed paying salaries to terrorists is "part of the Palestinian government's social responsibility" and that Israel is using the payments as an excuse to avoid negotiations. In addition, the US rebuked Abbas for failing to condemn last Friday's terrorist stabbing attack in Jerusalem,in which Sergeant Major Hadas Malka was murdered and four others wounded. The report also claimed that Trump will soon decide the future of the "peace process," and reported that Abbas refused to meet US Ambassador to Israel David Friedman. However, a senior White House official said the report was "nonsense." Jared Kushner "will submit his report to the president and, after it is submitted, :President Trump will decide if there's a chance for negotiations or it might be preferable to pull out of peace talks," the official said.